High Line Art’s third group exhibition kicked off this week with the installation of eight artworks by seven national and international artists. Titled Archeo, this exhibition explores humanity’s alternating fascination and frustration with technology. From the rusty industrial (reminiscent of the once-derelict High Line) Common Crossings by Marianne Vitale to the hauntingly contemporary and semi-familiar Skittles by Josh Kline, each work transforms the ordinary visitor into an archeologist, uncovering human-made “artifacts” of post-industrial society. This week’s Photo of the Week by photographer Timothy Schenck captures Jessica Jackson Hutchins’ organic and personal-feeling artwork, lovingly entitled Him and Me. 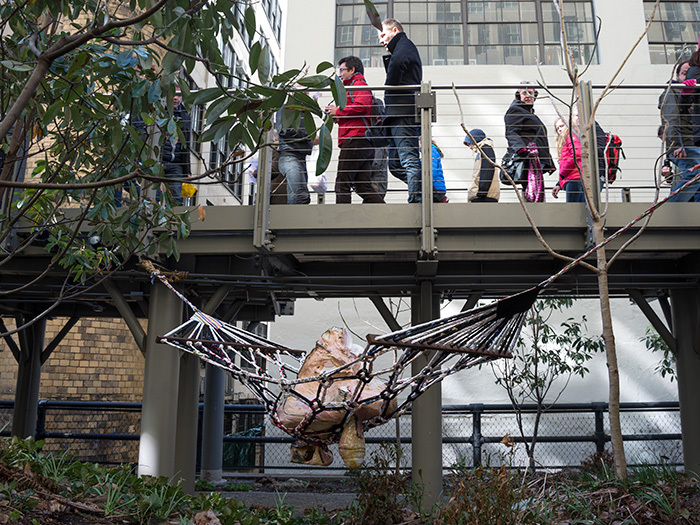 This ceramic sculpture takes respite in a hand-woven hammock beneath the High Line’s Falcone Flyover, between West 25th and West 27th Streets. Learn more about all of the artworks of Archeo.